Knickerbockers or knickers are a form of men's or boys' baggy-kneed trousers particularly popular in the early 20th century United States. Golfers' plus twos and plus fours are breeches of this type. Before World War II, skiers often wore knickerbockers too, usually ankle-length. Until after World War I, in many English-speaking countries (excluding Britain), boys customarily wore short pants in summer and knickerbockers ("knickers" or "knee pants") in winter. At the onset of puberty, they graduated to long trousers. In that era, the transition to "long pants" was a major rite of passage. See, for example, the classic song "Blues in the Night" by Johnny Mercer: "My mammy done told me, when I was in knee-pants, my mammy done told me, son..."
In Britain, they are always called knickerbockers (in British English "knickers" are women's underwear). The fashion was imported from the US around the 1860s and continued until the 1920s, when it was superseded by above-knee length short trousers (shorts), probably due to the popularity of the scouting movement whose uniform included shorts. Towards the end of this period, knickerbockers may have been more of a "fancy dress" item, for formal occasions, rather than everyday wear. At around 13 years, boys exchanged their knickerbockers for long trousers (again, in British English, never "pants", as above). Today, knickerbockers are sometimes worn for walking or golf. Baseball players wear a stylized form of knickerbockers, although the pants have become less baggy in recent decades and some modern ballplayers opt to pull the trousers close to the ankles. The white trousers worn by American football officials are knickerbockers, and while they have become less baggy, they are still worn ending shortly below the knee. In recent years, the NFL has equipped its officials with long trousers rather than knickers in cold weather. The name "Knickerbocker" first acquired meaning with Washington Irving's History of New York, which featured the fictional author Diedrich Knickerbocker, an old-fashioned Dutch New Yorker in Irving's satire of chatty and officious local history. In fact, Washington Irving had a real friend named Herman Knickerbocker (1779–1855), whose name he borrowed. Herman Knickerbocker, in turn, was of the upstate Knickerbocker clan, which descended from a single immigrant ancestor, Harmen Jansen van Wijhe Knickerbocker. Jansen van Wijhe invented the name upon arriving in New Amsterdam and signed a document with a variant of it in 1682. After Irving's History, by 1831 "Knickerbocker" had become a local byword for an imagined old Dutch-descended New York aristocracy, their old-fashioned ways, their long-stemmed pipes, and knee-breeches long after the fashion had turned to slacks. (Such cultural heritage sprang almost entirely from Irving's imagination and became a well-known example of an invented tradition.) "Knickerbocker" became a byword for a New York patrician, comparable to a "Boston Brahmin". Thus the "New York Knickerbockers" were an amateur social and athletic club organized by Alexander Cartwright on Manhattan's (Lower) East Side in 1842, largely to play "base ball" according to written rules, the first organized team in baseball history; on June 19, 1846 the New York Knickerbockers played the first game of "base ball" organized under those rules, in Hoboken, New Jersey, and were trounced, 23–1. The Knickerbocker name stayed with the team even after it moved its base of operations to Elysian Fields at Hoboken, N.J. in 1846. The baseball link may have prompted Casey Stengel to joyously exclaim, "It's great to be back as the manager of the Knickerbockers!" when he was named pilot of the newborn New York Mets in 1961. Hence also the locally-brewed "Knickerbocker Beer" brewed by Jacob Ruppert, the first sponsors of the TV show Tonight! ; hence the gossip columnist "Cholly Knickerbocker", the pen name of Igor Cassini; hence the extremely high-toned Knickerbocker Club (still in a neo-Georgian mansion on Fifth Avenue at 62nd Street, which was founded in 1871 when some members of the Union Club became concerned that admission policies were not strict enough); and hence the New York Knicks, whose corporate name is the "New York Knickerbockers". The Knickerbocker name was an integral part of the New York scene when the Basketball Association of America granted a charter franchise to the city in the summer of 1946. As can best be determined, the final decision to call the team the "Knickerbockers" was made by the club's founder, Ned Irish. The team is now generally referred to as the Knicks. Knickerbockers have been popular in other sporting endeavors, particularly golf, rock climbing, cross-country skiing, fencing and bicycling. Indeed, in cycling they were standard attire for nearly a hundred years, with the majority of archival photos of cyclists in the era before World War I showing men wearing knickerbockers tucked into long socks. They remained fairly popular in Britain (where they were called "breeks" or "trews") in the years between World War I and World War II, but eventually were eclipsed in popularity by racing tights, even among the vast majority of cyclists who never raced. Invariably referred to as "knickers" in the US, where the British definition of that term is unknown, they lived on as a just-past-the-knee variant of racing tights reserved for colder-weather riding. 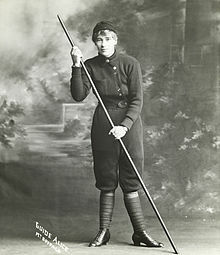 Knickers are still worn as part of the conventional uniform in fencing. Knickerbockers are often worn in baseball as pants, a custom that has been practiced even since long pants became widely used in the U.S. 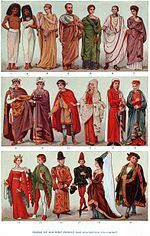 The traditional knickerbockers of old were more like pants that had been folded back with long socks. During the early 1980s, media interest in the then-Lady Diana Spencer brought a brief commercial revival of the look in women's and unisex fashion both in Europe and North America, particularly among the "town and country", "New Romantic", and "preppie" sets. However, by 1984 the style had waned as more top-heavy styles with snug pants rendered the style obsolete. In Japan, tobi trousers, similar to knickerbockers, are worn by construction workers, and their popular length has significantly increased over time, lowering the baggy part down the bottom of the leg like plus-fours and plus-sixes, and sometimes to the feet like trousers. In the United Kingdom, Ireland and some Commonwealth nations, the term knickers is used for women's undergarments. Use of the term owes its origin to illustrator George Cruikshank, who did the illustrations for Washington Irving's droll History of New York when it was published in London. He showed the old-time Knickerbockers in their loose Dutch breeches, and by 1859, short loose ladies undergarments, a kind of abbreviated version of pantalettes or pantaloons, were knickers in England. ^ Gonzalez, Darryl J. (2010). The Children Who Ran For Congress: A History of Congressional Pages. Santa Barbara, Calif.: Praeger. p. 83. ISBN 9-7803-1338-6664. ^ Compare transition to "long pants" with "Breeching (boys)." ^ "Making History - Short trousers". BBC - Radio 4. Retrieved 2018-08-06. ^ Frederic Cople Jaher, "Nineteenth-Century Elites in Boston and New York", Journal of Social History 6.1 (Autumn 1972), pp. 32–77. ^ "Tonight!" Knickerbocker Beer Show, 1953. Wikimedia Commons has media related to Knickerbockers.